Campsite jobs around Europe and the world are available. 30 people, adults and children, stand around me in the dark waving tiny pieces of crepe paper in the air. The men laugh awkwardly and the children tell them to be quiet, gazing into the starlit sky, mouths agape, arms pumping to and fro as if their lives depend on it. I smile inwardly. It’s a satisfying moment. It’s 10 p.m., and we’re standing in the second largest wetland park in Spain on a beautiful balmy evening. We’re looking for bats. I’ve told them that the larger bats are attracted by the fluttering of moths’ wings, and we’re trying to mimic the motion to “summon” the bigger bats. I’m not sure it really worked but it provided an evening of magic and entertainment for these tourists. The job that allows you to create this evening of fun is that of the “specialist campsite courier.” All over Europe, and the rest of the world, camping is still a hugely popular form of travel. Hotels and posh resorts attract a certain kind of tourist, and camping another. 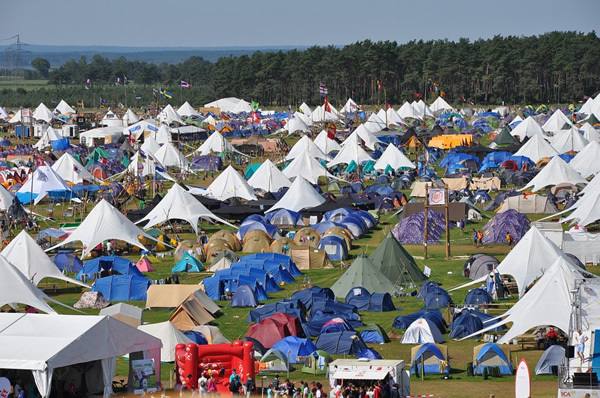 But the campsites where specialist campsite couriers work tend to attract a crowd in-between. These are campsites, usually set in stunning locations, but with pre-prepared tents with some modern conveniences inside. It might raise an eyebrow as to whether the term “camping” can be applied to this type of holiday, but for busy families with small children, it can be the ideal option. The role of a campsite courier is to welcome guests to the campsites, show them to their accommodation, clean the accommodation between visits, and provide various forms of help, including information, during the guests’ stay. It is a simple but incredibly demanding job, since cleaning inside tents in the middle of the day in July can be exhausting and uncomfortable. But often the hours are shorter than a normal job, and when you are finished, usually you are free to wander onto a beach or into a pool nearby. The purpose of the specialist courier is to entertain the tourists. There are children’s couriers, who run activities for children several hours a day: Couriers who look after teenagers, taking them paintballing, kayaking, or on some other adventure-activity every day; and then there are the wildlife couriers. Becoming a wildlife courier is a great first-step into the competitive job market of environmental or conservation work. If you have some knowledge of wildlife and have experience of leading guided walks, the job of wildlife courier is a possible option if you are interested in working in the environmental sector. You will be expected to offer a mixture of activities to all family members. This usually involves a medley of adventure activities (horse-riding, kayaking, canyoning), wildlife walks in nature reserves (bird-watching, evening bat walks), and the running of an environmental children’s club. How much you do of each depends on the area in which you are based and what is available to you. You are usually in charge of your weekly timetable and your choice of activities. It is a position that gives you a lot of independence and relies heavily on your creative and organizational abilities. A wildlife tent or, at least, notice board, is always provided for you to help promote your service, but you will always be expected to go and visit each guest after their arrival in order to present and explain what you do. You need to be energetic, convincing, charismatic, and have a great sense of humor. The point of your job is to make experiencing nature fun and interesting to those who might not have found it interesting before. This applies especially to children. Running the environmental children’s club was, for me, the highlight. Taking small groups of children on mini-beast hunts and pond-dipping trips, or making nature collages or giant insects, is fun and incredibly enlightening. I once had a 6-year-old child whose wildlife knowledge was greater than most adults, and she taught me a thing or two about damsel flies! Your wildlife knowledge will triple, as will your ability to deal with children, and adults, for that matter. All couriers work together as a team, helping each other out when needed. Customer service skills are important, as are teamwork and presentation skills. The wildlife courier experience doesn’t end with the tourists. You will be living as part of a much larger community, that of the rest of the campsite. There are often a mixture of nationalities but obviously with most staff from the country in which you are working. This is a fantastic opportunity to learn a new language; if you so desire, you can immerse yourself as much or little as you want into the local life. You are always provided with free accommodations, travel costs, and insurance. The accommodations will be a tent or a caravan, but the tent is often similar to the customer tents, so you’ll always have a double bed to sleep in and a cooking area in which to prepare your food. Time off is limited, but there is a minimum of one day off a week, with usually at least half a day more. Living directly on the campsite alongside the customers can be a benefit when you wake up as you only have to step outside to be at work. At other times it can be grueling, especially when someone asks you how to get to the nearest food market while you’re cleaning your teeth in the nearest shower block at seven in the morning. The salary isn’t excellent, yet with the free accommodations, it is possible to save a little. But the experience over the May-September season is well worth it. I recall the incredible feeling I’d get taking several groups of rowdy children and their disinterested parents into a beautiful nature park and hearing them continue to talk about it with excitement a week later. Catching a glimpse of a kingfisher, hiking amongst a swarm of bee-eaters, and searching for the wild boar are priceless experiences that will serve well in the future as wildlife work experience. Important note: Always investigate every job posting to verify that you have the correct visa or work permit. In some cases you can talk yourself into being sponsored, but it is very important to be sure that you have information or papers in hand before committing. Editor's note: This article is part of the series Caroline Nye has written based upon her experiences working abroad in an eclectic and adventurous mix of short-term jobs. See below for other articles on her personal Odyssey.